Save yourself time, money, and frustration by reading The Perfect Score Project, one of the most compulsively readable guides to SAT test-prep ever written, and a down-to-earth reminder of the things that really matter in life. The Perfect Score Project has inspired thousands of parents, students and teachers to connect and transform the most reviled right of passage in a high school student’s life into a positive experience. This book provides concrete research on the best ways to succeed on a test that serves as the last big milestone before kids leave for college. Debbie Stier is a single mother of two teenagers whose book publishing career spanned over two decades. 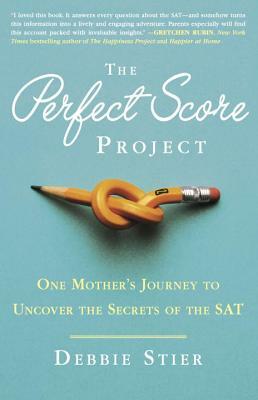 Her website, ThePerfectScoreProject.com, has become a major hub for SAT advice, and her book, featured in the New Yorker, USA Today, and The Atlantic. Stier has appeared as guest on The Today Show, the CBS Early Show, Bloomberg, NPR, and ABC, to talk about standardized testing and The Perfect Score Project. She lives with her son and daughter in New York City, but you can find her writing daily advice about education and SAT test prep on her website. "Vince Lombardi, the greatest football coach of all time, famously said, 'If we chase perfection, we can catch excellence.' He could have been describing Debbie Stier's unforgettable chase for a perfect SAT score. Her tips, lessons, and no-nonsense insights are insatiably useful. Her story is genuinely moving--not just a woman's obsession with a test, but a mother's love for her son. A perfect 800 in my book!" “Debbie Stier's saga of descending into SAT test frenzy is jam-packed with truly sound advice for conquering test fatigue, understanding superscoring, overcoming performance anxiety and perfecting the ‘fine art of bubbling.’ Enjoy Debbie's cautionary tale of obsession and taking seven SATS -- but don't try this at home!"